Ridgewood Canine Camp offers overnight boarding, but not like most kennels. 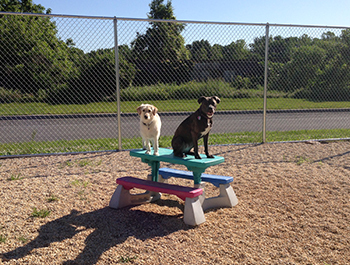 Your dog will spend the day in a playgroup with the regularly scheduled daycare dogs. 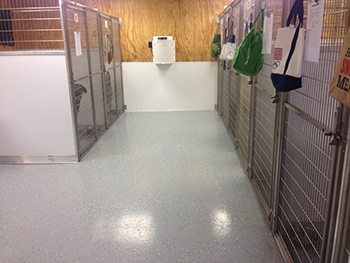 At night, we offer clean private kennels for your dog to sleep. Also, for your peace of mind, staff member, Meagan lives on site! Please send your dog’s food along so we can keep his/her diet consistent. You are also welcome to send any bedding, blankets, or toys. These items will only be in your dog’s personal kennel, but Ridgewood Canine Camp will not be held responsible for any chewed or damaged items. Please do NOT send bowls. We wash bowls after every meal and trying to determine which bowls go with which dog would be a real challenge! Prior to a boarding reservation, we prefer your dog to attend a few days of daycare. This allows your dog to become familiar with our staff and familiar with this active daycare environment. Each additional dog of the same household would be 25% off ($27/night). This discount only applies if the dogs can share a kennel at night. And the dogs must be able to eat at the same time in that kennel. Dogs may be dropped off and picked up anytime during our business hours. We are closed on Thanksgiving Day and Christmas Day. Other holidays, including Memorial Day, July 4th, Labor Day, and New Year’s Day will be treated as a weekend and the hours will be 8am-9am and 5pm-6pm. REQUIRED. There is no minimum or maximum stay. Please plan ahead as our summer months and holidays FILL UP VERY FAST. If you need to cancel, please give us 72 hours notice. We almost always have a wait list and your timely cancellation will allow us to give that kennel space to another dog.